THIS WAS THE WAY TO CROSS FROM SAN IGNACIO TO SANTA ELENA FOR MANY YEARS (maybe from the 1800's). This was long before the Hawkesworth Bridge was built, 5 cents one way. Then in 1947 to July 1949, a pontoon was built out of empty drums to cross.the river. 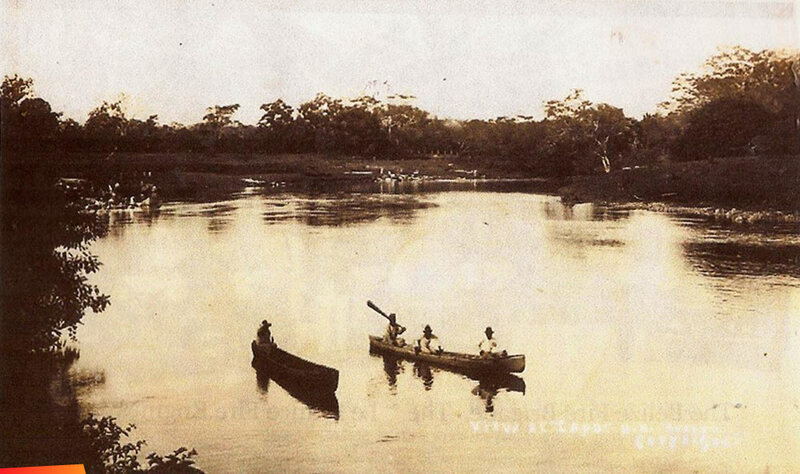 This pontoon served to transport materials for the construction of the Hawkesworth bridge from the San Ignacio side to Santa Elena. These were interesting days, especially when the river was very flooded, because of the logs floating down and fallen trees. BUT WE YOUNG ONES ENJOYED IT. I personally had to cross the river TWICE. The Belize Old River passing by our Cattle Farm and the Macal at Santa Elena. THE ONLY TIME WE DID NOT PAY WAS ON GOOD FRIDAY, since the Good Friday procession was held in Santa Elena. The owners of the doreys would facilitate their doreys to build a floating crossing FREE OF COST. We offer our belated thanks to those kind owners, whose names we offer all blessings. THESE WERE THOSE IMPORTANT PEOPLE: Adelaido Guzman, Tomas Paiz, Tino Castellanos, Cipriano Requena and sometimes Mauricio Wicho Popper would join. Women - Donia Aniceta Garcia, Chica Garcia and Monica Garcia.